Language Log » Noah's Arch? 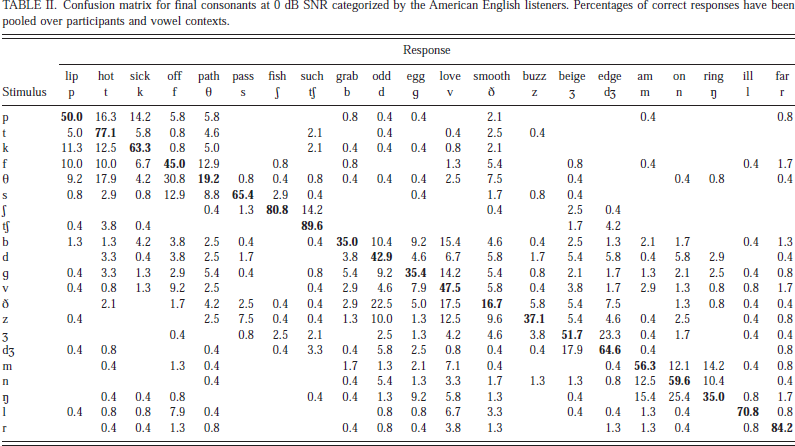 Even at 0 dB SNR, final American-English /tʃ/ was heard as /k/ only 0.4% of the time by native speakers. Of course, the original message would presumably have been in proto-Afroasiatic, or Sumerian, or something, where by the laws of chance, the two words were probably not even as close as ark and arch are. What a silly idea! Everyone knows God speaks French and in French, it's arche for both ark and arch. Mystery solved. I notice that in Cutler et al's matrix, they investigated words ending in -VC. Are there any studies for words with final consonant clusters, possibly even differentiating between rhotic and non-rhotic pronounciation of -VrC? We have the likes of "archangel" and "archi-" to help the confusion along, though. And God speaketh 16C English. My Bible tells me so. Actually everyone knows that Gods speaks Spanish: God told Noah to build an arch (arco), but Noah heard "arca", and made his Ark (arca). God was like "no, arco, as in arco iris", and sent the rainbow to help with a little rebus action. The Hebrews still didn't get it, and built an "arca" again (la Arca de la Alianza, the Ark of the Covenant), at which point God got fed up and just bedevilled them with everything else they went on to go through in the Old Testament. There is the potential confusion between arc and ark, but the work on god's drafting table clearly shows "the arch." I wonder if god uses CAD now. In Paris I found that it's l'Arc de Triomphe but l'Arche de La Défense. Can anyone explain why? Unless it was a Sunday – The angels speak Funish on Sundays because it please the Lord so. And wasn't Noah pre-Babel? I though the tongues didn't get confused until after that towering disaster. No speakers of Aramean around – apart from almighty, all-knowing, all-present ones? In the Torah, the "ark" is called the teiva (תֵּבָה). It is, by the way, an entirely different word from the other Biblical Ark (of the Covenant), which is called the aron (אֲרוֹן). But Noah's Ark jokes always assume that if English was good enough for Noah, it's good enough for us. The Far Side had one in which all the animal couples of each species are waiting outside the ark, and Noah says, let's do this in alphabetical order, and the zebras think, "Damn." What I'd like to know is how the same otherwise obscure (in English) word came to mean both the Ark of the Covenant and Noah's Ark when the original Hebrew uses words that are so different. This is also the case in Russian (with a word not linguistically related to "Ark" no less, but having roughly the same original meaning, a container that stores things). Presumably this was an adaptation (or translation) of the original Latin word, but why was it the same word in Latin, and why was it kept as the same word in translation? Furthermore, why has the word never been used more widely (outside sailor slang, etc) when modern Hebrew still has the words' quite literal meanings and their extensions? @Kylopod, didn't see your post. Could have shortened mine. You all must be new here. Since Noah was pre-Babel, he must have spoken the same language as Adam and Eve, and everyone knows that they spoke Flemish. The LXX translation of ark was "kibotos" for both, which caused pre-Vulgate Christians to interpret Noah's kibotos as a small box rather than a big boat. Jerome deliberately used different words for the two arks. there is indeed l'Arc de Triomphe, but there is also l'Arche de la Défense (aka La Grande Arche). I admit the difference, if any, eludes me. Bulbul is contradicting the thesis of Andreas Kempe that, in Edenic times, YHWH spoke Swedish, Adam spoke Danish, and the Serpent spoke French. How likely is it for American English speakers to mistake Anne Cutler for Ann Coulter? Apparently, 8.3%! I'm not familiar with all the details of the story; is it anywhere stated that Noah didn't receive his instructions from God in (mispronounceable, misinterpretable) writing? On the intertubes, one sees kids getting confused about story arches and arcs and arks with some frequency. To this Frenchman, arche is certainly more natural than arc in an architectural context. Also when I was younger I was quite surprised at the Ark in _Raiders of the Lost Ark_ not being shaped like an arch. I agree with Laurent C that arche is the more natural (meaning commonly used) word in architecture. Except for Arc de Triomphe (most likely a literal translation from Latin), such constructions, free-standing or as part of another construction (in a bridge or a doorway, for instance) are called arche, the word arc referring to the bow shape rather than the construction itself. The word arche in the architectural sense is a derivative or reformation from Latin arcus 'bow', but arche 'ark' is from the unrelated Latin word arca meaning a box or other container for hiding or securing things. in Edenic times, YHWH spoke Swedish, Adam spoke Danish, and the Serpent spoke French. What did Eve speak? and how did they all understand each other? (but I forget that languages were not "confused" yet – perhaps everyone spoke their own language and all understood each other, unlike after Babel). marie-lucie, I regret that I have not myself read Kempe's masterwork Die Sprachen des Paradises (first published 1688; I'm not sure if it was ever translated into English) and am relying on summaries in various secondary sources. There is apparently not complete scholarly consensus as to whether Kempe was engaged in intentional parody of the my-language-was-the-Ursprache genre exemplified by the Flemish claim referenced above or simply pursuing the genre so energetically as to fall into inadvertent self-parody. Failure to specify what language Eve spoke has apparently been previously raised as an objection to Kempe. It should perhaps be noted that in the 3d chapter of Genesis Eve engages in dialogue with both the serpent and (after she and Adam get busted) the LORD God, but never (on-stage) with her husband. Did He send an archangel to inform Noah of the ark? Did Noah realise that, on the bright side, at least he'd never have to see his arch-enemy again? J.W. Brewer said: "in the 3d chapter of Genesis Eve engages in dialogue with both the serpent and (after she and Adam get busted) the LORD God, but never (on-stage) with her husband." Presumably, just like so many 21st century couples, she was at church while he went down the pub. uh… but WHY did The Lord want Noah to build an arch in the first place? Was he supposed to found the first St. Louis? The first MacDonalds? I suppose it's only luck that Noah didn't construct and train the first illicit drugs interdiction officer. I know I'm late to the party on this post… But the comic does make sense if you actually pronounce "arch" as "ark". Maybe it's just me, but that's how I pronounce it (most of the time, I think). Maybe I just don't make a distinction in my mind between "arch" and "arc". Both mean basically the same thing (a curved shape). It's not like I have any French influence there–I speak only English and a few tiny bits of Spanish. This is extremely late, but wanted to record I'd just come across an instance of the Goropius Becanus phenomenon but sort of in reverse: namely, an alleged teaching of the Georgian Orthodox Church that Georgian will be the language in which the Last Judgment will be carried out. The Omegasprache rather than Alphasprache, you might say. I cannot vouch for the authenticity of the anecdote (the books I have that give English translations for the hymnody of Lazarus Saturday sometimes note material differences between the Greek and Slavonic textual traditions, but anything unique to the Georgian version would I believe be outside their ken), but details may be found here: http://tinyurl.com/yevxvme.